Truth time for a minute, because every bride has big worries for her big day. Are her flowers going to look good? How many of her bridal party members will show up polished and put together? Will she last in her wedding heels for more than a few hours? The list goes on and on and on, but we’ll tell you something that probably doesn’t get first priority in terms of concern: #1 and #2. Yes, pee and poop. If you’re a bride, you’ve probably prepped for everything you can think of for your wedding day, but if you haven’t yet thought about your trips to the toilet in that big ole dress, well then you haven’t considered all of it. We caught up with the industry’s best kept secret for slaying the bathroom stall situation when you’re wearing a wedding dress, and Bridal Buddy, we’re forever your besties!!! I’m pretty sure I didn’t think about peeing on my wedding day until I was four mimosas in that morning, dressed, hair finessed, and already starting to feel my photographer start stressing about the pre-ceremony timeline and whether or not we’d get all the girl shots we needed to at the venue done before we needed to be in the limo. And as soon as I realized that I needed to void ALL the champs like a champ, I grabbed my sister, dragged her into the bathroom with me, and literally had her uncorset my entire gown and hold it before I could go into the stall (utterly and completely naked, I’ll have you know. So much fun). In any case, whether you’re having trouble envisioning your potty point-of-view for the day, haven’t yet thought about who will serve as your “pee posse” to protect that precious dress of yours, or just realized that your wedding will be falling on day 2 or 3 of your period, it helps to have a GP for dealing with TP. Our biggest suggestion: either get yourself a Bridal Buddy preemptively and proactively or start serving hints to your girl squad that you’re getting stressed about peeing in your dress. Chances are, they’ve been in your place before, in a dress that just wasn’t conducive to bladder relief, and they would have DIED for some help to get back on that dance floor. They’ve got your back, so they’ll make sure you have your Buddy. 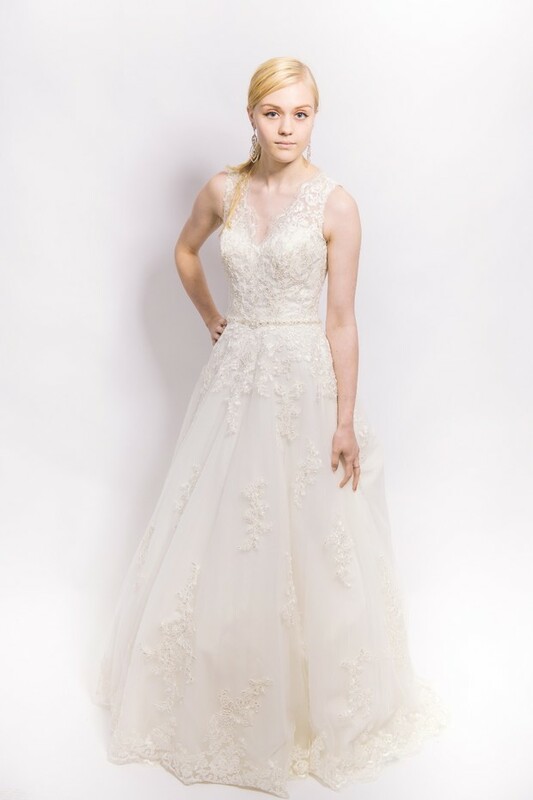 Attention brides-to-be and all ladies who wear special occasion gowns! 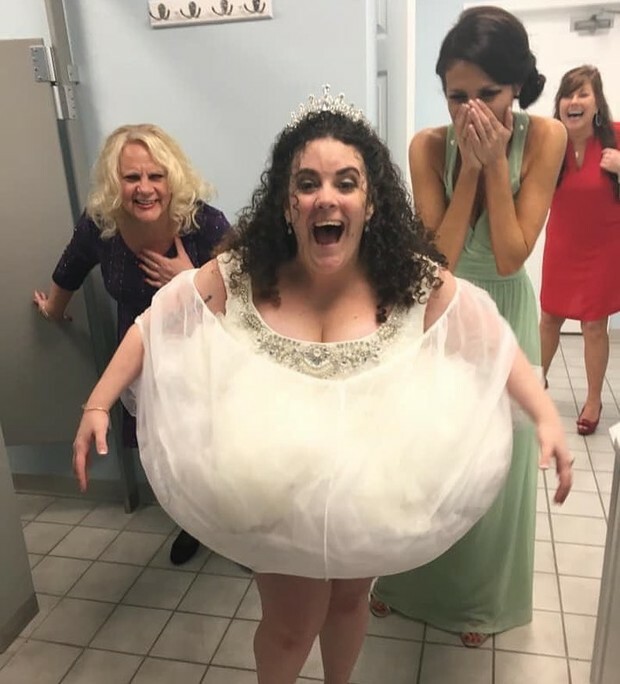 Bridal Buddy® is the first and ONLY slip on the market worn under the gown that helps bag up and protect your lovely dress in the bathroom stall so you can use the bathroom in peace! It also picks your gown off the ground so it stays clean while walking outside - buhbye dirty hemlines! Bridal Buddy was invented by Heather Stenlake, a former bridal consultant, after years of hearing sooo many brides come in and out of her bridal shops asking “How am I supposed to go to the bathroom in this thing?” She was tired and turned off by her consultant colleagues who would tell concerned brides to take off their gown, or have their bridesmaids hold it above the toilet. She even heard some mention using a hot sticky garbage bag. And that was that, her faith in her bridal shop family was forever flushed!! Bridal Buddy was made for women who want to use the bathroom on their own, in peace, with no help in the small bathroom stall. For the women who want to protect their gorgeous and expensive gown from the toilet, bathroom floor, or the dirt, rain and mud of the outdoors while walking for photos, or from the car to the reception. For the women who have medical issues, Crohn’s disease, IBS or that “time of the month” when they just want to use the bathroom in private. Truthfully, brides worry about getting red wine stains on their gown, about someone stepping on their delicate train and ripping it, about sweating through their silk or having sauce from a cocktail hour reception station splash up on their dress, but the spills waiting to strike in a bathroom are sooo much more likely (and grosser). 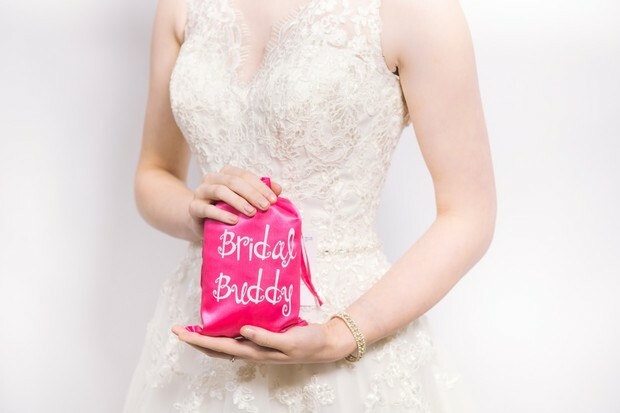 We’re calling it, the Bridal Buddy is an imperative go-bag buy for the bride. And yes… Although the product is meant to be self-sustainable, who wouldn’t want their girls in on the goofiness that can only come with hysterical bathroom pics?!?!! Have we helped you wipe away some worries yet?? Get your shop on so that your dress can stay dirt, pee, and poop-free on the best day of your life! Enjoy 15 percent off with promo code 'WEDDINGCHICKS15' (expires 5/31/19). We partnered with Bridal Buddy to give brides a hint about how to help their tinkle on the day they tie the knot. As always, thank you for supporting our sponsors!